After spending almost an entire week in Northern Italy, it was time to journey down to Rome for a few days. We stayed in the Appio Latino district, a few underground stops from the city center. We found the best restaurants were away from the super-touristy spots, hidden in small side streets, and sometimes didn’t even have menus! We had a great (and cheap!) dinner our first night in Rome at a place where the owner just asked what we liked, and brought something out to match our requests. Our favorite find, though, was Pompi, an awesome breakfast/bar/dessert joint just a block away from our B&B. It didn’t matter what time of day you went in, it was always crowded… with good reason: morning croissants, evening tiramisu, late-night drinks, all were great. We loved the late-night food/drink culture in Rome! 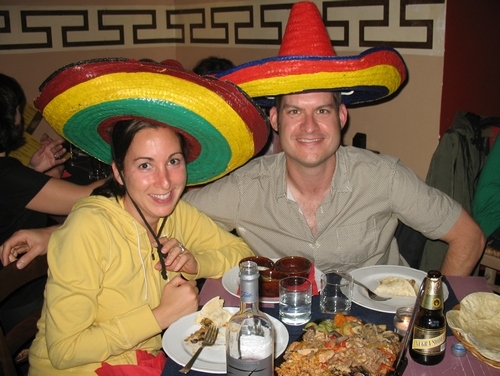 Favorite cultural “what-the?” moment: We eventually tired of pizza and pasta, so we sought out and found… a Mexican restaurant! It was surreal being in the center of Rome having an Italian waitress explain to us how to assemble and eat fajitas. The Cinque Terre region is famous for its white wines (trails connecting the five villages go right through the vineyards), and being right on the Mediterranean, seafood was fresh and plentiful. 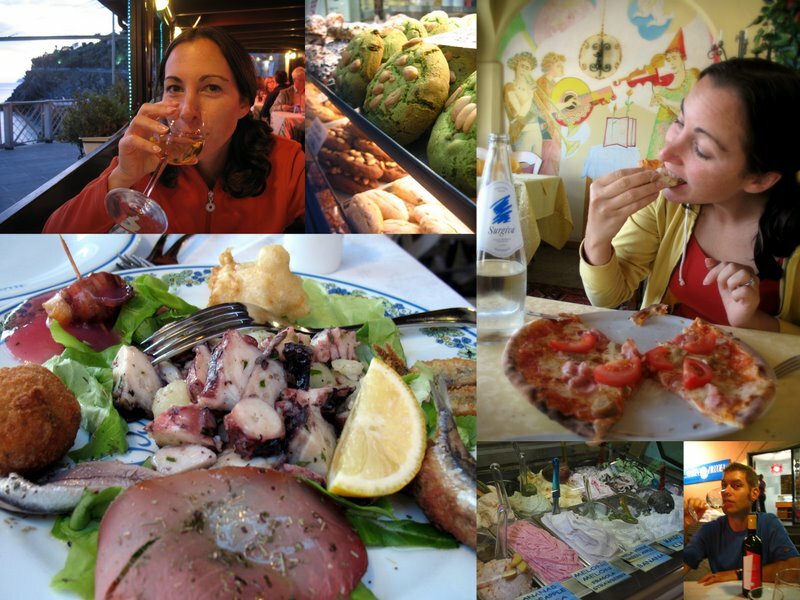 We had dinner at Marina Piccola our first night, and I was thrilled with the mixed seafood appetizer plate, which included the tenderest octopus I’ve ever eaten, along with anchovies marinated in olive oil, fried anchovies, an anchovy fritter (they heart the anchovies here!) and a bacon-wrapped scallop. Fantastic. Trattoria Dal Billy was a fun find, with great food and quite the entertaining waitstaff. Nothing like having booze-soaked fruit spoon-fed to you after dinner, while being told that it’s POISON! If it weren’t for all the hiking, walking, stair-climbing, sightseeing, etc., I’m sure we would have packed on quite a few pounds on this trip — but hey, the site’s called We [Heart] Food for a reason! This entry was posted on Monday, October 13th, 2008 at 7:30 pm	and is filed under Italian, Mediterranean. You can follow any responses to this entry through the RSS 2.0 feed. You can leave a response, or trackback from your own site. That seafood appetiser plate at Marina Piccola sounds so good! I would love that!